An outstanding Egyptian Stone vessel, likely dating to Pre-Dynastic Period, ca. 3200 BC. The vessel was carved and afterwards polished to a very high degree in a hard stone type, possible a kind of marble. Of archaic Vase form, very elegant and with beautiful veins and clouds in the white stone. Size: ca. 20 cm. tall, very substantial in hand! Egyptian footed jar of a Semi-chalice form, dating New Kingdom, 18th. Dynasty, 1550-1292 B.C. A museum quality piece, gently shapen, massive and tall and with a very old provenance to Danish Collections. The medium a terrific veined stone, very attractive. Fantastic massive Elamite cylinder seal, Assyrian period ca. 1400 BC! A massive and important Cylinder seal in brown stone, perhaps Jaspis, Middle Assyrian period, Elamite style, ca. 14th. century BC. The seal exceptional in quality, made in a style typical for the Elamites and with the peculiar drilling in the top only. The original bronze ring still inserted in the top, the bottom engraved with an animal. An impressive massive figure measuring 33,5 cm. in height. Skillfully carved. Once carved, the figure was covered in a thin layer of gesso and painted in red, black, cream, and white hues. This example still retains carved and painted facial details and a classic cap-styled coiffure. We have 4 of these beauties in stock, the other 3 with full TL tests from the Ralf Kotalla lab dating them to ca. 1420, during the Ming Dynasty, (1368-1644 AD). This particular figure has not been tested thus it's cheaper, since tests are expensive, but has the same guarantee for authenticity and comes with a COA. Massive Chinese sculptural wooden head of a Guardian, ca. 17th. cent. Massive and very impressive antique wooden head of a Guardian Demon, Late Ming-early Qing Dynasty, ca. 17th. century AD. A crowned 'larger than life' head carved with remarkable, fearsome features and with remnants of old pigment in the devices and one tiger stone inserted in left eye. The high crown is carved with images of seated and standing Buddhas. An exceptional Jade pendant of a Fish, Chinese Song Dynasty or earlier,(960-1279 AD). 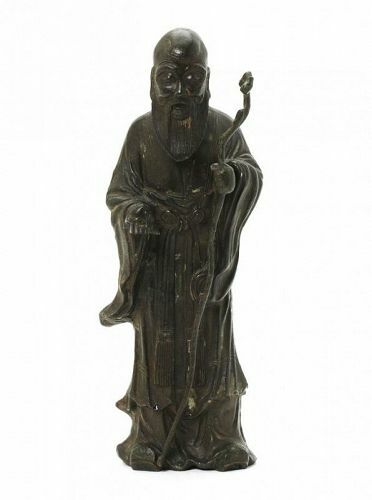 A little gem of a Jade carving in celadon and Russet Nephrite with fine inclusions. The fish with many finely incised details of scales, head and tail. Conditionn: Intact, superb for the type, with smooth wear and patina. 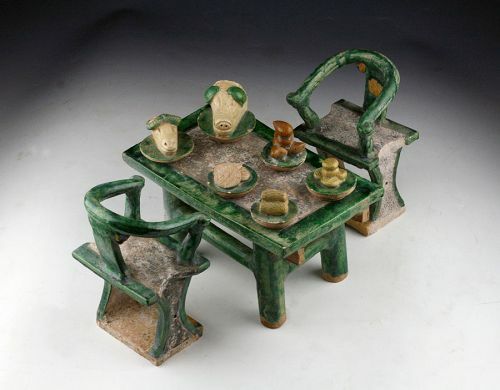 A beautiful and very rare set of a large pottery model of an Offertable with food and two Horseshoe Chairs, Chinese, dating to the Ming Dynasty 1368-1644 AD. Huge Egyptian wood Ptah-Sokar-Osiris figure as Ushabti! A huge Wooden Ptah-Sokar-Osiris figure, made to an Ushabti, during 1st. millenium BC. Polychrome pottery Vessel in the Shape of a Trophy Head Peru, Nazca, Early Intermediate Period ca. 350-450. Wonderful vase with the features of a bearded man, pointy nose and chin. Painted in shades of red, brown and black. Tattoos under the eyes. Likely a warrior. Size: 13 cm. tall and 14 cm. wide. Condition: Choice small chip to the inside of the rim. Ex. German private Collection from Baden-Wüttemberg. Large and choice Hellenistic tanagrina, terracotta statue from Tanagra (Greece), 4th.-3rd. century BC. A terrific large figurine of the woman dressed in long gown, very fine sculptural quality details. Condition: Intact with a fine patina and some remnants of pigment.